Béatrice Martin is a canadian musician (singer, songwriter, pianist etc). 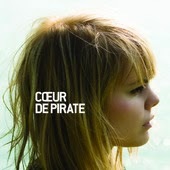 Her stage name is Coeur de Pirate (heart of pirate), and she started playing the piano when she was 3 years old. Then, at 15 she started her music career as the keyboardist of the band December Strikes First. 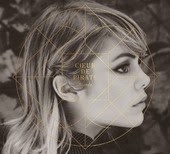 She released her debut album, Coeur de Pirate, in 2008. It is consisted of 12 tracks. It is an album that I listen to without skipping any song, just like her second album, Blonde, released in 2011, consisted of 14 tracks (deluxe version). Her lyrics are one of the most beautiful ever. She's a great poet. I can never decide my favorite songs, because it all depends of the moment I'm living. She never makes huuuuuge lyrics, you know? But they are always so meaningful, so brilliant! She's the reason I decided to learn French. If I'm down, I always want to listen to music that will make me cry like a baby, tearing endlessy, don't ask why. So, I listen to Fondu Au Noir, Corbeau, Francis, and her version of Je Suis Venue Te Dire Que Je M'en Vais. When I'm happy, or, you know, hyper and all, I listen to Danse et Danse (my favorite atm), Verseau, Adieu, Golden Baby... Ahh! Hard to list!! I just like to listen to ALL of her songs. I have to listen to her voice at least once a day. You can stream to the whole Blonde album here. Being Coeur de Pirate isn't the only thing she does. She has recorded a song with Bedouin Soundclash, called Brutal Hearts, and then started a musical project with Jay Malinowski, vocalist and guitarist of Bedouin Soundclash. Their co-working turned out to be great, you see! 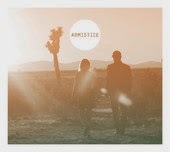 The project is called Armistice. It's a lot of music to listen to, so do it when you have time. Because it REALLY is good music.